Paul Evans was among the community of midcentury modern studio furniture craftsmen like Wharton Esherick and George Nakashima who helped make the greater Philadelphia region a prominent center for studio craft in the late 1960s. Today his highly innovative experimental approaches to metal attract an international following. 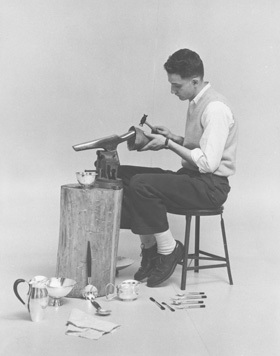 During the early 1950s, Evans pursued the career path of a designer-craftsman, using his knowledge of metals and metalsmithing techniques to produce flatware and hollowware (fig. 1). 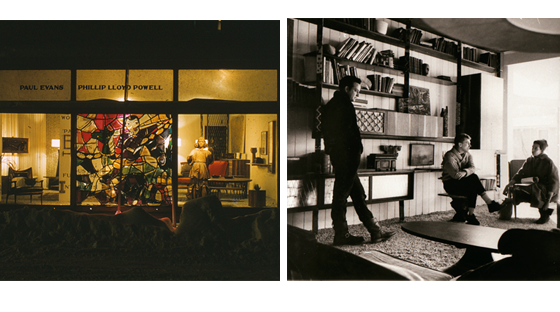 Drawn to New Hope, Pennsylvania, in 1955, he began sharing a showroom with designer craftsman Phillip Lloyd Powell (figs. 2, 3). During the next decade, Evans evolved from metalsmith to furniture maker as he began creating metal furniture and sculpture, manipulating materials to achieve novel expressive surface effects. Moving into the 1970s, he replaced his crusty, textured surfaces, patinated with paint and acid, found on his furniture of the sixties (cat. 38) with brilliant, shifting reflective metal surfaces, sometimes mixed with figured woods (ca. 57). In 1964 Evans joined forces with the Directional Furniture company and began pursuing a new phase of his career where, in many ways, he followed more of a design than craft paradigm. Directional offered Evans opportunities for marketing and selling his work throughout the United States while the business demanded that he continuously introduce new lines. 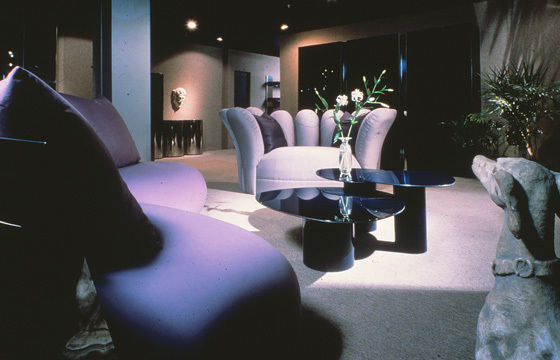 In his effort to constantly create new furniture lines with expressive surfaces and highly charged visual presences, and in his eager acceptance of new technology and new production methods, Evans blended and blurred the domains of craft, design, and fashion.2 However, by the late seventies, his Directional lines proved too costly and complex to maintain. Ending his relationship with Directional in 1979, he opened a showroom in New York City at 306 East Sixty-first Street in 1981, where he began to explore with his son Keith the kinetic possibilities of furniture while also developing upholstered seating forms with Pop imagery (fig. 4). Prior to his untimely death in 1987, he joined forces during the eighties with Design Institute America, for which he designed not only kinetic furniture but revolving rooms with mirrored walls that were perfectly suited to the postmodern fondness for hybrid forms and mirrored surfaces. 1 See Robert Slifkin, "Paul Evans and the Legacy of Modern Welded Sculpture: Between Decoration and Expression," Paul Evans: Crossing Boundaries and Crafting Modernism (Stuttgart: Arnoldsche Art Publishers, 2014). 2 See Edward S. Cooke Jr., "Fashioning Craft, Crafting Fashion: The Ambitions of Paul Evans," Paul Evans: Crossing Boundaries and Crafting Modernism (Stuttgart: Arnoldsche Art Publishers, 2014).